With over 250,000 apps to choose from in Apple's App Store, you can make your iPhone or iPod Touch do just about anything you can imagine -- and almost certainly a few things you would never think of. 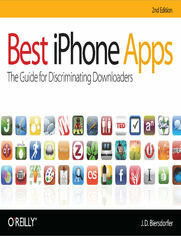 While it's not hard to find apps, it is frustratingly difficult to find the the best ones. That's where this new edition of Best iPhone Apps comes in. New York Times technology columnist J.D. Biersdorfer has stress-tested hundreds of the App Store's mini-programs and hand-picked more than 200 standouts to help you get work done, play games, stay connected with friends, explore a new city, get in shape, and more. With your device, you can use your time more efficiently with genius productivity apps, or fritter it away with deliriously fun games. Play the part of a local with brilliant travel apps, or stick close to home with apps for errands, movie times, and events. Get yourself in shape with fitness programs, or take a break and find the best restaurants in town. No matter how you want to use your iPhone or iPod Touch, Best iPhone Apps helps you unlock your glossy gadget's potential.